3 Dolina Strugu is 299 km 2. It consists mainly of farming fields. 37,5 thousand people live there. Dolina Strugu includes 4 communes: Błazowa, Chmielnik, Hyzne, Tyczyn. 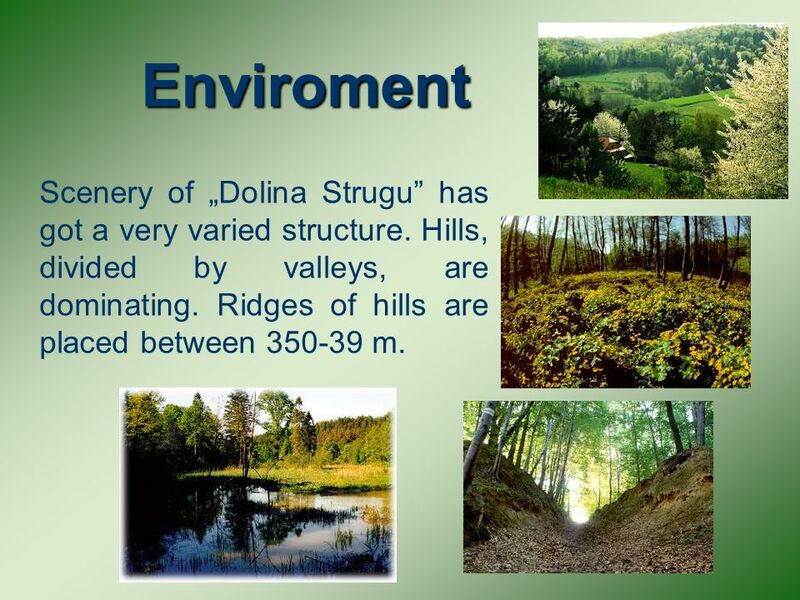 4 Enviroment Scenery of Dolina Strugu has got a very varied structure. Hills, divided by valleys, are dominating. Ridges of hills are placed between 350-39 m.
5 On the area of Dolina Strugu dominate springs, which mostly have very gainful white radiance. The most famous are: Waterholes In Przylasek, in the hamlet of Hermanowa and on the area of Dominicans priory in Borek Stary. 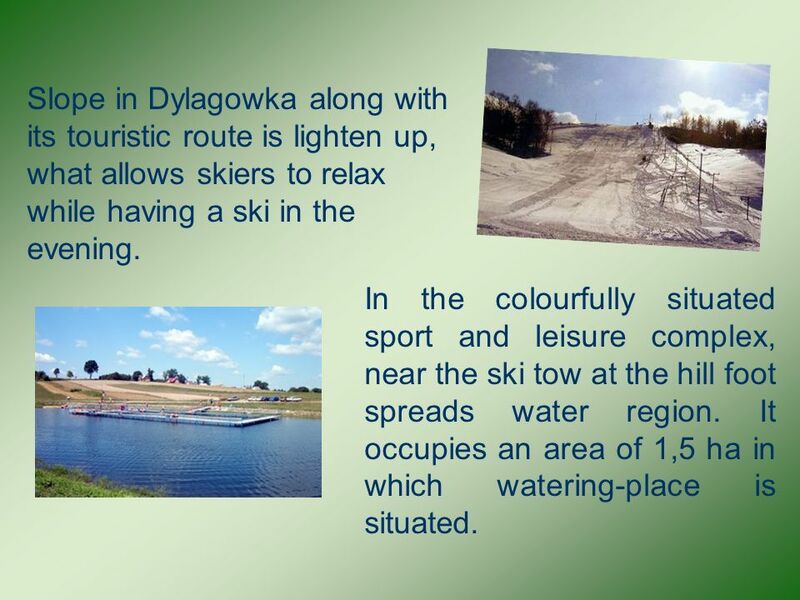 6 Slope in Dylagowka along with its touristic route is lighten up, what allows skiers to relax while having a ski in the evening. In the colourfully situated sport and leisure complex, near the ski tow at the hill foot spreads water region. It occupies an area of 1,5 ha in which watering-place is situated. 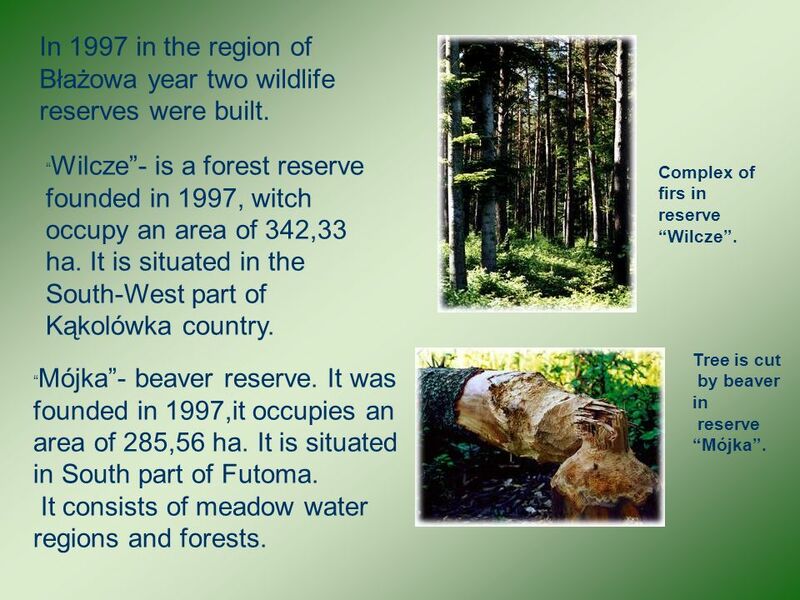 7 In 1997 in the region of Błażowa year two wildlife reserves were built. Wilcze- is a forest reserve founded in 1997, witch occupy an area of 342,33 ha. It is situated in the South-West part of Kąkolówka country. Mójka- beaver reserve. It was founded in 1997,it occupies an area of 285,56 ha. It is situated in South part of Futoma. It consists of meadow water regions and forests. Tree is cut by beaver in reserve Mójka. Complex of firs in reserve Wilcze. 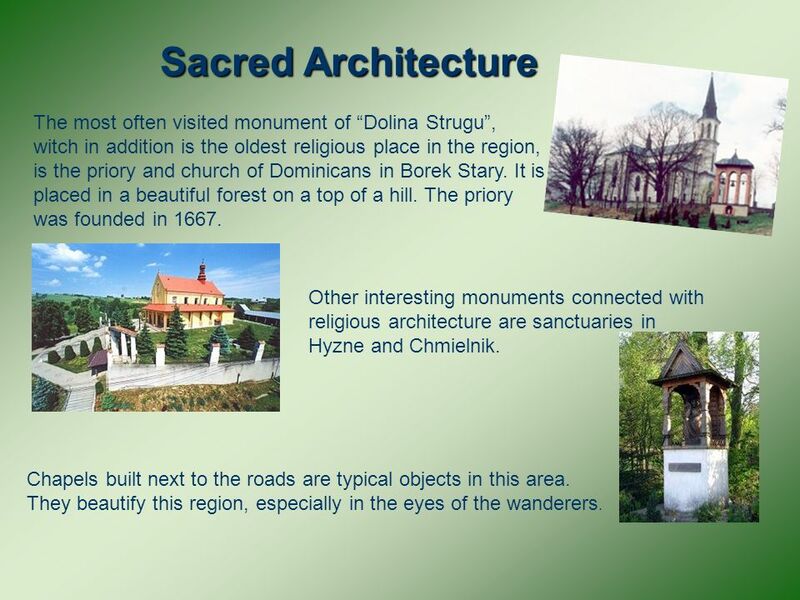 8 Sacred Architecture The most often visited monument of Dolina Strugu, witch in addition is the oldest religious place in the region, is the priory and church of Dominicans in Borek Stary. It is placed in a beautiful forest on a top of a hill. The priory was founded in 1667. Other interesting monuments connected with religious architecture are sanctuaries in Hyzne and Chmielnik. Chapels built next to the roads are typical objects in this area. They beautify this region, especially in the eyes of the wanderers. 9 Culture Each borough pays much attention to the cultivation of traditions and the development in the sphere of culture. 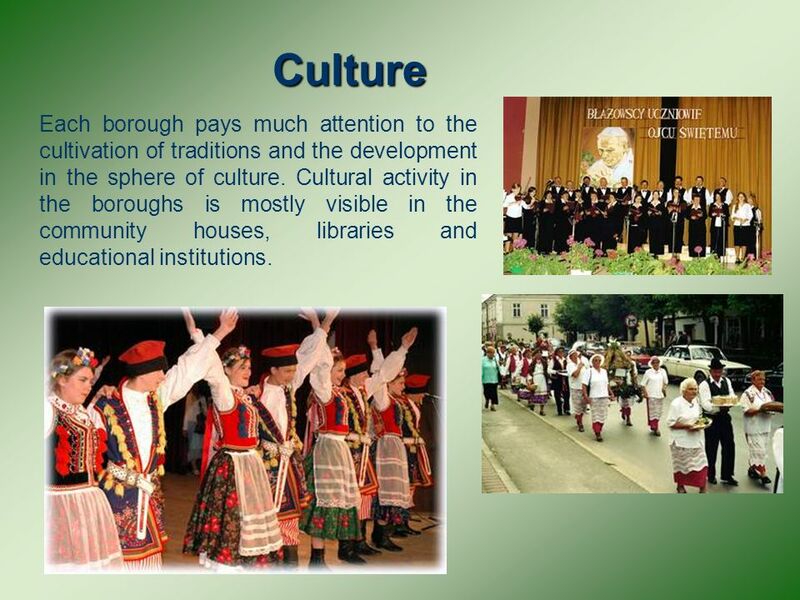 Cultural activity in the boroughs is mostly visible in the community houses, libraries and educational institutions. 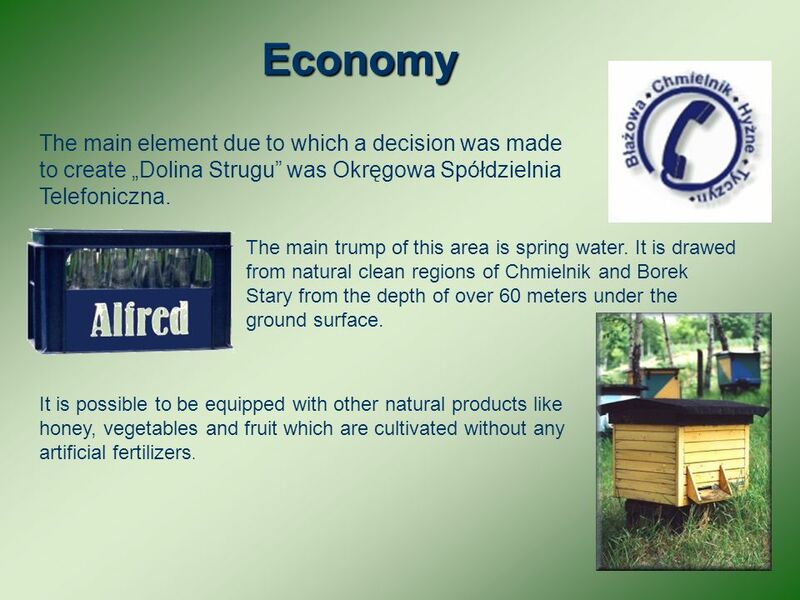 11 Economy The main element due to which a decision was made to create Dolina Strugu was Okręgowa Spółdzielnia Telefoniczna. The main trump of this area is spring water. It is drawed from natural clean regions of Chmielnik and Borek Stary from the depth of over 60 meters under the ground surface. It is possible to be equipped with other natural products like honey, vegetables and fruit which are cultivated without any artificial fertilizers. 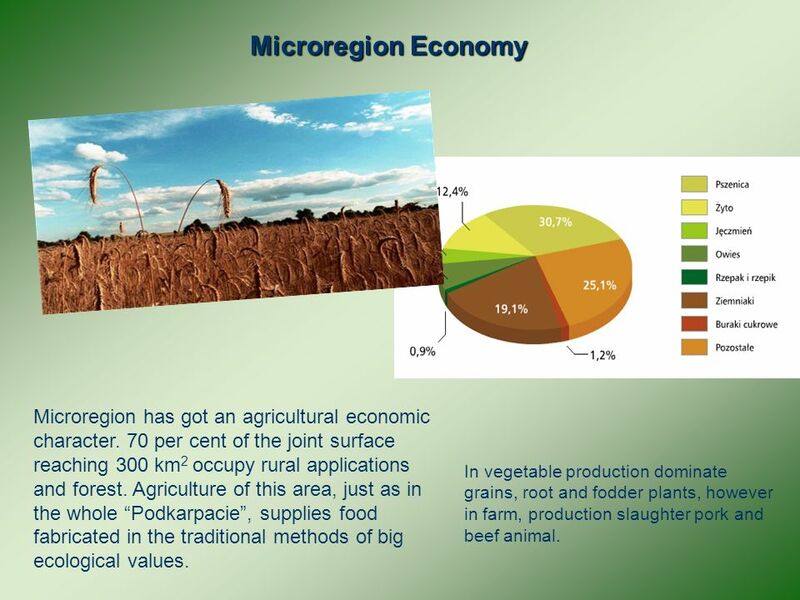 12 Microregion Economy Microregion has got an agricultural economic character. 70 per cent of the joint surface reaching 300 km 2 occupy rural applications and forest. Agriculture of this area, just as in the whole Podkarpacie, supplies food fabricated in the traditional methods of big ecological values. In vegetable production dominate grains, root and fodder plants, however in farm, production slaughter pork and beef animal. 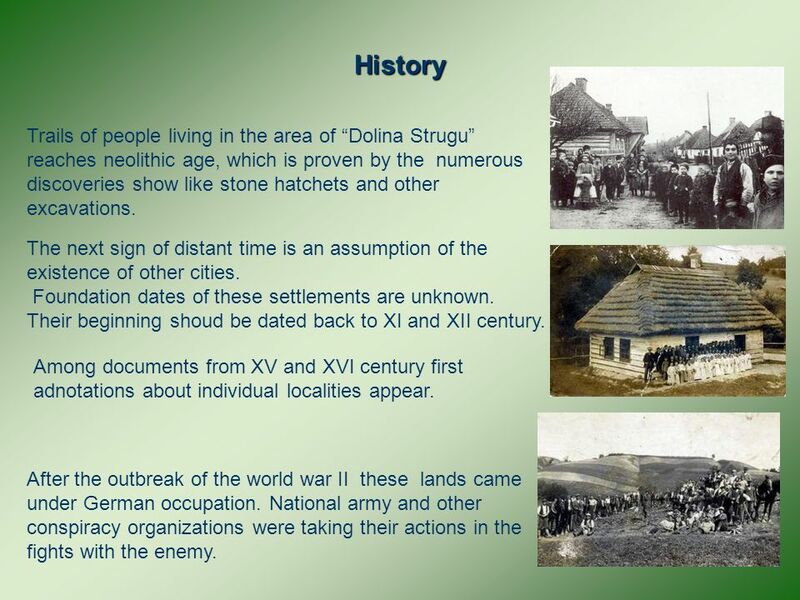 13 History Trails of people living in the area of Dolina Strugu reaches neolithic age, which is proven by the numerous discoveries show like stone hatchets and other excavations. The next sign of distant time is an assumption of the existence of other cities. Foundation dates of these settlements are unknown. Their beginning shoud be dated back to XI and XII century. Among documents from XV and XVI century first adnotations about individual localities appear. After the outbreak of the world war II these lands came under German occupation. National army and other conspiracy organizations were taking their actions in the fights with the enemy. 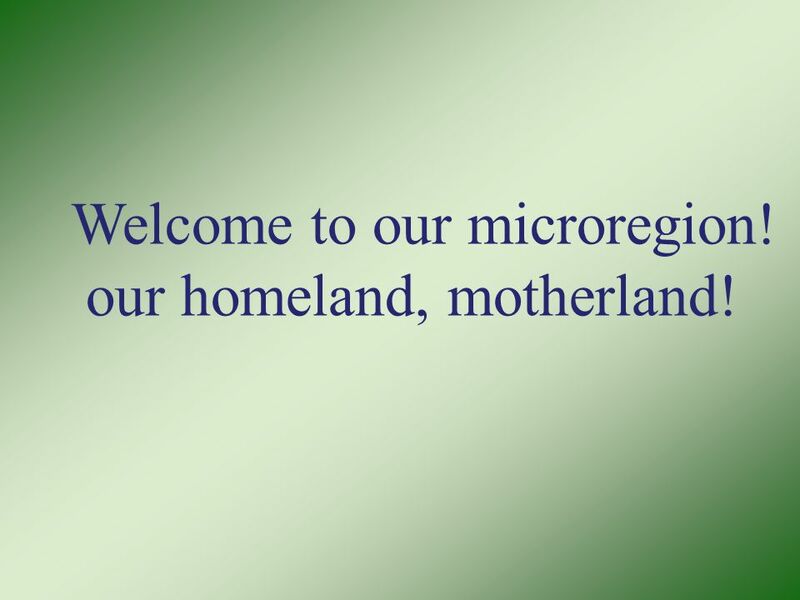 14 Welcome to our microregion! our homeland, motherland! 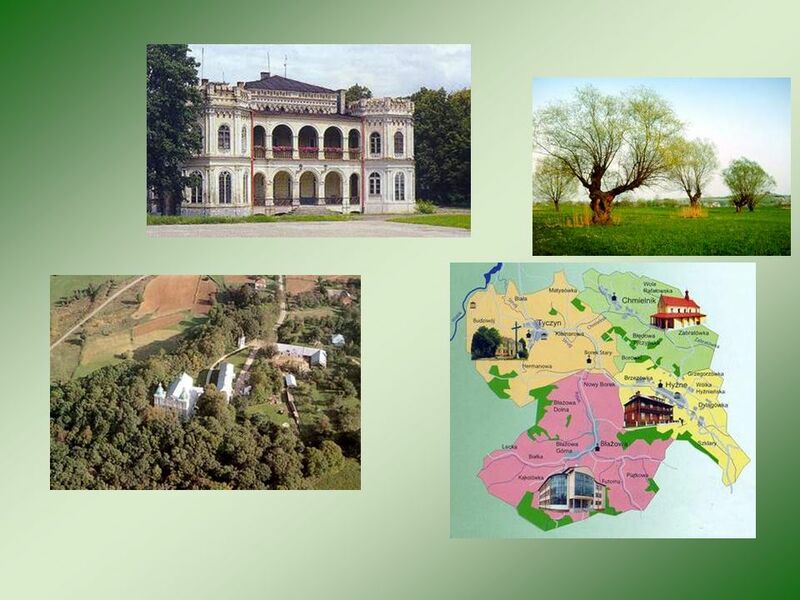 Download ppt "Tyczyn commune Dolina StruguDolina Strugu our little homeland our little homeland." Many beautiful houses have been built New schools have been established ( Kielnarowa WSiZ High School) New roads have been built The population has increased. Rzeszów departament Poland is divided into 16 administrative regions. Each region is composed of several departaments Our region is «PODKARPACIE and our. Hungary Hungary is a landlocked country in Central Europe. OUR ALBERTA BY: KELLY, SARAH AND CHASE. WHAT MADE EARLY SETTLERS COME TO WHAT IS NOW ALBERTA? The early settlers came for the good land in Alberta. It. Introduction : - Situation of city - Climate - Population - Monuments - History - Economy. Kielce - city in Poland, the capital of Świętokrzyskie Voivodship. Situated to the south of Warsaw and having a population of 210,000. District of Dzierżoniów The District of Dzierżoniów is situated in Lower Silesia approximately 50 km southwest of Wrocław and stretches across part of. MEET POLAND AND ITS BEAUTY IMPORTANT FACTS NATIONAL SYMBOLS - OUR FLAGEMBLEM CAPITAL - WARSAW AREA – 312 THOUSAND SQUARE KILOMETRES POPULATION – ABOUT. CHARACTERISTICS OF THE FOREST FUND RESTITUTION PROCESS IN TRANSITION COUNTRIES: THE IMPACT ON RURAL COMMUNITIES THE GEOGRAPHIC CONTEXT Mădălina Teodora. 1. 1. The reservoir (lake) in Kostkowice The paddling- pool with a slide in Krępa Rock climbing The Jurassic cycling trail (route) of. Foundations of Civilization First Civilizations Egypt Mesopotamia. PARTNERSHIP CITIES AND SCHOOLS BELGIUM – SANKT VITH GERMANY - WORTH GREECE – ACHAIA HUNGARY - ORKENY ICELAND – VIK SPAIN – LAS PALMAS POLAND – BIRCZA. Key Issue 1 Where did Agriculture Originate? Geographical causes of the sraeli Palestinian conflict raphy-how-geography-contributes- to-the-israel-palestinian-conflict.html. CHAPTER 1: TOWARD CIVILIZATION PREHISTORY –3000 B.C.